On the planet Jijo, peace is upended when the starship Streaker arrives, bringing with it knowledge of a two-billion-year-old fleet and hordes of followers eager to exploit its power. Publishers Weekly hails Brin's "extraordinary capacity to handle a wide-ranging narrative and to create ... complex alien races." 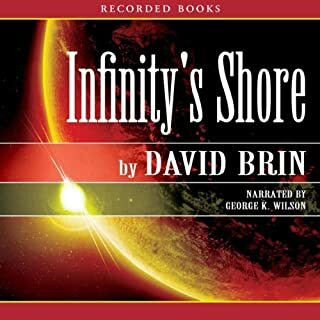 This is the second installment of the "Brightness Reef" trilogy, and is set in Brin's "Uplift Universe." It is a continuation of Brightness Reef, which should be read first. The conclusion, "Heavens's Gate," is not available in audio as of this posting. The other novels in the Uplift Universe are Sundiver, Startide Rising, and The Uplift War, all available from Audible. It is not strictly neccessary to read them first, though I highly recommend the last two for the added background and events. They are both excellent in their own right. In a nutshell this trilogy is hard SF, offering a thought-provoking story of science, technology, and sociology. 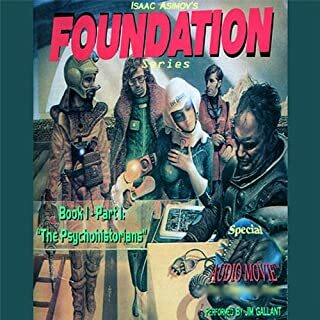 It examines the plight of five races who, seeking to withdraw from the rigors of galactic civilization, illegally settle an abandoned world to find peace, only to have galactic events intrude. The trilogy is excellent, and IMO the first two books are among the best hard SF has to offer. The plot is interesting, with many unexpected twists. The pace is fast, the writing strong, and the characters well-drawn. It is a true page-turner. I would echo the other reviewer in pleading for the timely release of the final installment of this trilogy, Heaven's Gate. This is really a review of the series of three books. The premise is interesting - an earth suddenly reassembled from fragments of deferent epochs - and the writing reasonably good, but the resolution is at best unsatisfying. I'm not convinced that the central premise (the actions of the firstborn) is even that sound. Two quibbles. First, as many have noted the contrived accents are horrible in the first book, particularly those of the Americans. Second, anti-American prejudice underscores the series. American characters are at best chauvanistic cowboys and at worst mass murderers, while the non-Americans are sensitive and enlightened. The authors matter-of-factly trumpet some questionable philosophy as an easy panacea for all the worlds ills. This sort of thing can usually be shrugged off, or may in fact appeal to many readers. 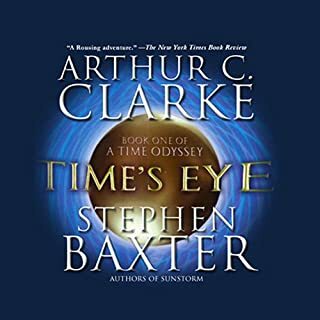 The idea of an earth reassembled in time has been explored before, notably in the excellant "October the First is Too Late" by Fred Hoyle (1966, no audio that I am aware of). After 12,000 years, the once-supreme Galactic Empire was plunging into a future of barbarism and warfare. All knowledge previously created by mankind faced destruction. Only Hari Seldon, creator of the revolutionary science of psychohistory, foresaw the dark age of ignorance that was to come, and set out to preserve knowledge and mankind itself. Just to underscore what others have said: the music between scenes was unbelievable frustrating. I timed one particular transition at over three minutes!! That may not sound like much, but believe me anything over 8 seconds is intolerable. My only explanation is that the producer is a teenager who got a synthisizer for his birthday and thinks its really cool.